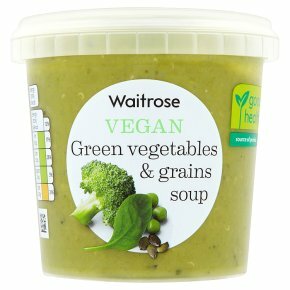 INGREDIENTS: water, broccoli (21%), peas (13%), onion, coconut cream (coconut extract, water), spinach (3%), cooked brown rice (water, rice, salt), soya beans, black kale, quinoa seed, pumpkin seed, leek, buckwheat, rapeseed oil, garlic purée, lemon zest, salt, basil, cornflour, buffering agent (sodium bicarbonate), black pepper. Gentle heat 6 - 7 mins. Empty contents into saucepan. Heat gently, stirring occasionally, until piping hot. Do not allow to boil. Stir before serving. Do not reheat once cooled.